Roanoke, Broadcast Community Shaken After Journalists Killed On-Air | Broadcast Public Service: Local Stations. Big Impact. The fatal on-air shootings of Alison Parker, 24, and cameraman Adam Ward, 27, of Schurz Communications’ CBS affiliate WDBJ-TV Roanoke, Va. caused shock, anxiety and sadness throughout the industry. The Roanoke community and fellow broadcasters across the country expressed their grief and support. "Every morning we watch these people on TV, it’s like they’re part of your family," WDBJ viewer Donna Toliver told USA Today. Following the tragedy, NAB, the Radio Television Digital News Association and the National Academy of Television Arts & Sciences launched the “Alison & Adam Memorial Fund” for the victims’ families, for which $40,000 has already been committed. 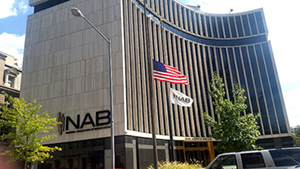 “Our hearts are heavy with grief over this horrifying act of violence against two individuals with a zest for life and a love of broadcasting," said NAB President Gordon Smith. NAB also flew its flags at halfmast at the association’s headquarters to honor the victims.